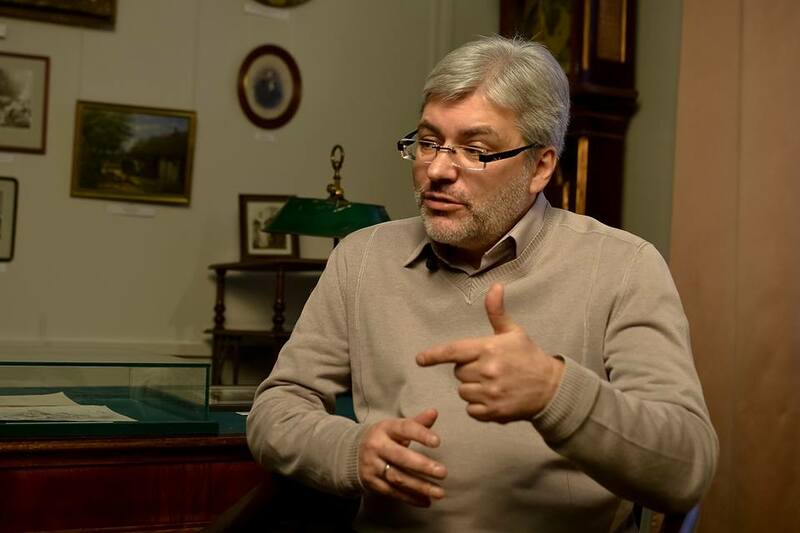 Evgeny Vodolazkin (Евгений Германович Водолазкин) was born in Kiev in 1964, where he graduated from the Faculty of Philology, and acquired his Master degree at the Institute for Russian Language and Literature (topic of Master thesis: ‘Chronicles of George Hamartolos in Old Russian Literature’). In 2000 he acquired his PhD degree after presenting the thesis ‘World History in the Literature of Old Russia’. He works at the Institute for Russian Literature in St. Petersburg, and since 2012 he has been editing the almanac of the Pushkinskii Dom ‘Text and Tradition’. Evgeny Vodolazkin has always stated that he was fortunate and honoured that, for a decade and a half, his scientific mentor during his time in the Institute for Russian Literature was the greatest linguist of the 20th century Dmitry Sergeyevich Likhachov. He is the author of over a hundred scientific papers on old Russian literature, books Dmitry Likhachov and His Epoch and Language Instrument: About People and Words, and novels: Abduction of Europe (2005), Solovyov and Larionov (2009) and Laurus (2013). The novel Solovyov and Larionov was finalist for the award ‘The Book of 2010’, winner of literary award ‘Andrei Bely’ and Award for Philological Courage and Originality, declared the best book in Russia in 2010. The novel Laurus won ‘The Book of 2013’ award, ‘Yasnaya Polyana’ award and the award of international association ‘Portal’. Due to exceptional popularity of the author, in 2013 the novel Solovyov and Larionov was reprinted with autobiographical novella Close Friends. Laurus is the most important book of the year , it emits warmth, it should be urgently printed in 50 million copies, so that there is enough for all adults in the country. As a child, after reading a book, I wanted to become a musketeer or a pilot – when I read Vodolazkin I want to become a saint. Solovyov and Larionov – the book of the year 2010 in Russia. Armed with the knowledge that the past shows us the present, historian Solovyov, contemporary of our time, sets off to research what happened to the imperial general Larionov, who defeated the Red Army in the Crimea in 1920. On two occasions, the general planned and executed accomplishment of the Spartan king Leonidas, who fought in the pass of Thermopylae. In the first battle, which was a great victory, the general did not boast. The second time he suffered the inevitable defeat, but it did not break him. Historical occasions and world politics contributed to the defeat of the white movement, but the general Larionov, who is the symbol of all white generals, managed to turn defeat on the battlefield into a moral victory: he organised rescue of large number of people who arrived to Crimea, running from the Red Army. On Yalta, in our time, in search for deeper layers of reality, passing through the general’s former summer house, and later communist apartment, through Chekhov’s house, through text of discovered memories and through conventional scientific conference ‘General Larionov as a Text’, Solovyov’s research history branches into detective and love stories, and he reaches personality of the general. Scientific truth for him becomes the existential one. Through another person, he reaches himself in this novel. Larionov is Russia that we lost. Solovyov is Russia that is not lost yet. Evgeny Vodolazkin builds bridges between them. The one who wants to believe in Russia, hearty in spirit, wise, with feelings and sense, should not miss the book by Evgeny Vodolazkin. Evgeny Vodolazkin confronts two main characters in two epochs, two time periods. We could perceive his exceptional ability to write about everything in an easy, humorous way. Even when describing tragic and difficult events, the writer plays, jokes and has fun: he writes the novel with the dose of sophisticated humour, through which, as the main point, emerges irony that turns into satire and sarcasm. Since the novel has exceptionally convincing plot and twist, one can think that Akunin is on the surface. But, if one goes a little deeper, there is Zoshchenko. Communal apartment, cadets, scientific world, if you take a closer look at them, there is Bulgakov. This is the book, where history and fiction intertwine, simultaneously building and disintegrating each other. Using the technique of narrative mirror, the author directs the destinies of two characters in a way that they merge and explain each other. While young historian Solovyov writes his PhD thesis about White Guardist Larionov, revealing the mosaic of the general’s life, he also explores his own life. Following the trails of Larionov’s battles and private life, young Solovyov travels from St. Petersburg, through Yalta, to his hometown that will prove to be focal point for understanding both his own life, as well as the mystery of general’s survival after the victory of the Red Army. Abduction of Europe is a novel that every Serb must read, after which, I am certain, he/she will feel proud to belong to the nation whose existence and behaviour present a motive for unmasking those who are warmongers of the modern world, as well as to provide the background against which those who oppose them at any cost are come to the forefront. The topic of the novel Abduction of Europe is, primarily, a fight against militarism and modern colonialism, as well as the aspiration to create a strong, powerful, united and independent Europe, built on the principles of equality, freedom and justice. Such Europe, multinational but united, the one that acknowledges diversity and has the same standards for all, is the ideal for all its citizens, or at least those who are considered to be the wisest, noblest and most advanced. (Српски) У СУСРЕТ ПРОСЕФЕСТ-у 2015.